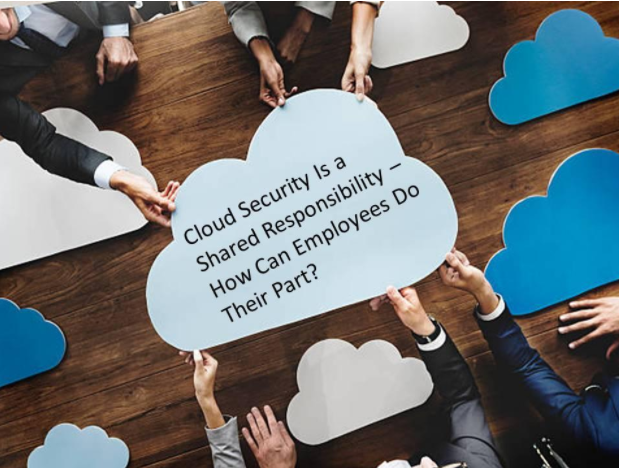 Cloud Security Is A Shared Responsibility – How Can Employees Do Their Part? When the matter of data security is concerned, an organization has many weak links and one among them is often a careless employee. They are the soft targets to get past an organization’s defense mechanism and their sheer numbers are often a cause for concern for any firm. So, no matter how strong or sophisticated software a firm has implemented, it still needs to look at the common threats and counteract the risky behavior with a shared responsibility; thus enabling the enterprises to keep their data safe. Weak Passwords: Weak Passwords, even though easy to remember, are still easier to crack. New guidelines have come about propagating the use of passphrases. These are longer than passwords but simple and memorable. They are more secure even without the addition of special characters. These necessarily do not make sense as a complete sentence and it may be something which your mom used to tell you. They are unknown to the hacker and makes sense only to you. Password Re-Uses: Employees find it easy to re-use the same password across all applications especially when your organization doesn’t have single sign-on. This becomes a problem when the hacker gains access to the password. Here password managers can help the employees to choose multiple memorable passphrases and how to handle them effectively. Password Sharing: It may seem harmless for employees to share their passwords with their colleagues so that they are able to handle the accounts in their absence, but it can pose a big risk. The passwords can be stolen, guessed or hacked easily making it harder to change it. Thus ways must be found to provide access to only authorized users and some auto-forwarding facility during an employee’s absence. Multi-Factor Authentication (MFA) or the two-step authentication is the best way to secure an account even if the password is compromised. This protection feature is employed in privileged accounts where data is very confidential and may even allow users to move throughout the network. It is the work of the employees that they be vigilant and informed, however tough it may be because it is the first step in preventing what could be a big data breach. Phishing among these is the most common of the enterprise security attacks that take place wherein a hacker tries to manipulate the recipient by tricking him to reveal confidential information or perform certain tasks that will compromise their account. Cloud Security is a shared responsibility so the employees can be trained to look out for suspicious emails, names, links and emails that are incorrect and don’t match, spelling mistakes or urgent messages. Sophisticated attacks can be tough to spot but it does no harm in keeping the employees informed and prepared. Organizations need to be vigilant about the unsecured wireless connections and malware downloaded from unfamiliar sites. Organizations need to bolster their defense against such attacks by installing authorized applications on devices, use of secure wireless connections and performing regular cloud security scans. The organization should encourage employees to report anything suspicious because a false alarm is still better than a neglected enterprise security breach. Organizations need to implement the right data security solutions, It is a shared responsibility stay up-to-date with software, monitor for cloud security breaches and properly train their employees if they are to keep themselves secure. But the onus also lies on the employees to do their part in securing data. The employees can indeed become the strongest links in your defense against cyber threats when they understand and put in their efforts to follow a culture of enterprise security and vigilance in the organization.